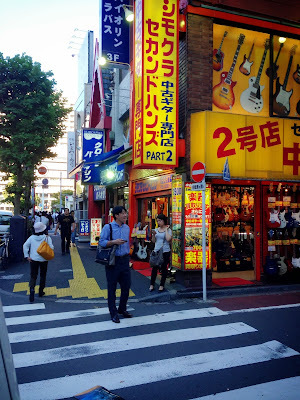 There is a magical place in Tokyo called お茶の水駅前 (Ochanomizu Eki Mae / "In front of Ochanomizu Station"). This place is nothing short of a musician's dreamland because upon exiting the station, what lies right before you is a shopping district especially for musicians! The shopping street itself is only about 200 meters long, but both sides of the street are lined with music specialty shops, all of which are several stories high. 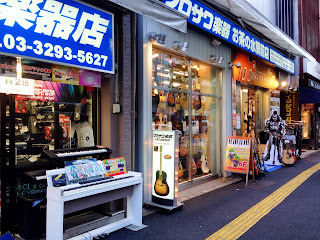 Electric guitar shops (like "Big Boss Guitars"), acoustic guitar shops, brass specialty shops, orchestral string instrument specialty shops, DJ equipment and keyboard shops, drum specialty shops, sheet music and musicians' accessory shops, pretty much anything you can think of is right there waiting for you, and all shops have items from all over the world in stock. I looked in the window of one store and saw a collection of gorgeous trumpets from Japan, America and Germany, all very reasonably priced, too. If you don't find exactly what you want, it would be a miracle I think, and if the main shopping street doesn't meet your needs, some of the more obscure, hidden shops along the side-streets and alleyways probably will. As a side-note, I want to mention that I've always liked the name "Ochanomizu," because it translates into "tea water."